Andreas Weber is a German academic, scholar, and writer who holds degrees in marine biology and cultural studies. Weber holds that an economy inspired by nature should not be designed as a mechanistic optimization machine, but rather as an ecosystem which transforms mutual sharing of matter and energy in a deepened meaning. 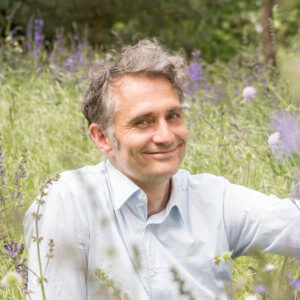 His books in English include Enlivenment: Towards a Fundamental Shift in the Concepts of Nature, Culture and Politics (2013); The Biology of Wonder: Aliveness, Feeling, and the Metamorphosis of Science (2016); and Biopoetics: Towards an Existential Ecology (2016), and Matter and Desire (2017). Weber regularly contributes to major newspapers and magazines, such as National Geographic, GEO, and Die Zeit, and has won a number of awards for his writing. Andreas Weber teaches philosophy at Leuphana University, Lüneburg and at the University of Fine Arts, Berlin. He has two children ages fifteen and seventeen and lives in Berlin and Italy.